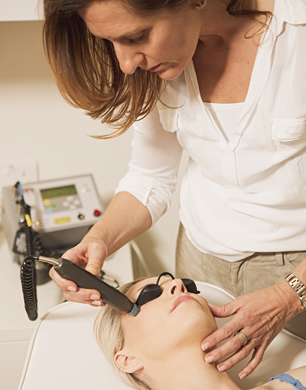 Low Level Laser- The Holy Grail of Facials? There’s something to be said for low or cold laser technology (also known as LLLT); not only is it the go-to treatment for permanent hair removal, it is also recognised for speeding up the healing of sprains, tendinitis, and arthritis. The same machine (different frequency) is also used to reduce inflammation and tissue damage- improving skin texture and diminishing scars, and has proven results on acne and psoriasis. Never having experienced the power of a laser, I was intrigued as to what an LLLT treatment would involve- I’d heard that Sharon Stone is a fan, so booked myself in. 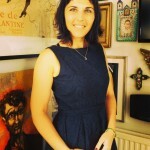 Heading to Harley Street to meet my therapist Ruth Phyer, I was more than a little apprehensive, and although the treatment is non invasive, it’s still a bit scary getting anything “done” on your face! With such a wide usage, I felt more confident, and was reassured it was a perfectly safe treatment for tackling wrinkles and repairing the skin’s ageing tissues, as it works to plump up collagen from within. With a fairly straightforward process, a small hand-held machine pulses light on to the problem areas, this in turn converts to light energy within skin cells which stimulates a process that tricks the body into producing new collagen (which is what all the posh moisturisers also promise), but this gets to the root of the production, and skin consequently repairs at a rapidly increased rate. Reaching my mid forties, and loving the sun, I have my fair share of skin damage. I am also a bit of a chatterbox, and love a good laugh, so have some “expression” lines too. However I wasn’t judged by Ruth! Having time for a proper consultation meant that she could understand my lifestyle and gave me realistic expectations. And she assured me that although the skin is the organ that is naturally most exposed to light, that is why it also reacts so well with the infrared rays. My main concern for quite some time have been my laughter lines by my eyes. I don’t wear glasses yet, so my face is fully exposed! But this is something that Ruth promised me she could definitely target; I was also nervous that I didn’t want to come out looking polished or plastic, or like I had actually had a treatment at all.. In fact, I just wanted to come out like a natural version of me, but with minimised wrinkles! As a non evasive therapy, I wasn’t expecting any pain, and all I experienced was a kind of buzz, which was by no means unpleasant. The machine resembles a massager, and emits ectronic frequencies over problem areas, and the whole experience was quite relaxing! With a principle of transmitting low laser rays directly into the skin- the collagen building and cell turnover is all speeded up which give an overall appearance of healthy skin. After an hours worth of zipping up and down my face, I was passed a mirror, and was pleasantly surprised! Gone was my weary, hump day face- I looked like I had just woken from a beautiful sleep! Fresh, cleansed and glowing; Ruth was delighted at the outcome, and I was even more so! Apparently I had taken to it like a duck to water. So of course, I booked in for another one..
And much as I don’t like to boast, but I think I might have found the holy grail! Prices for treatments: £240 per session and/or a course of 3 treatments – £540 (£180 each).